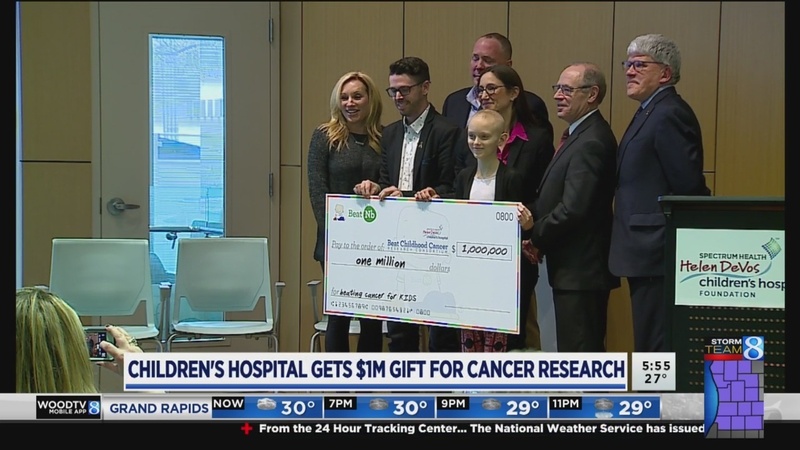 GRAND RAPIDS, Mich. (WOOD) – The fight against childhood cancer got a big bump in Helen DeVos Children's Hospital, which welcomed a $ 1m check on Monday. "I mean, it's not every day someone donates money like this," said patient Cambri Dorko from Vicksburg. The funding from Boston-based Beat NB will go towards research that is already making progress towards neuroblastoma in children. Dr. Giselle Sholler, director of pediatric oncology research at Helen DeVos Children's Hospital, is on the front line . "We are learning more and more all over the country around the world learning about different cancers by understanding mutations that cause them and what drives these cancers to grow," she said. 2, has fought neuroblastoma since she was 5 years old. Monday she was standing next to Sholler, who has been studying her cancer cells for the past year. "It teaches us the construction of her cancer and which drugs may or may not be affective to her cancer. It is important not only which substances will work, but which substances will not work so we do not waste her time, "Sholler said. If you ask Cambri, it is time spent. Her latest scans show no active cancer in her body. "We believe this is the future of cancer care in general," Sholler said. With the new money, Sholler will be able to practice more precision medicine. The goal: To open two new clinical trials using data discovered in the laboratories at Helen DeVos Children's Hospital. "We are focused on really trying to understand each child's cancer with the help of precision medicine. As we do biopsies of children's cancer … we sequence them to understand DNA, RNA, mutations, cancer biology and test which drugs there are must be specific to that child, "Sholler explained. "I hope it (neuroblastoma) will soon go away," she said.